 Your complete survey builder and panel management platform. 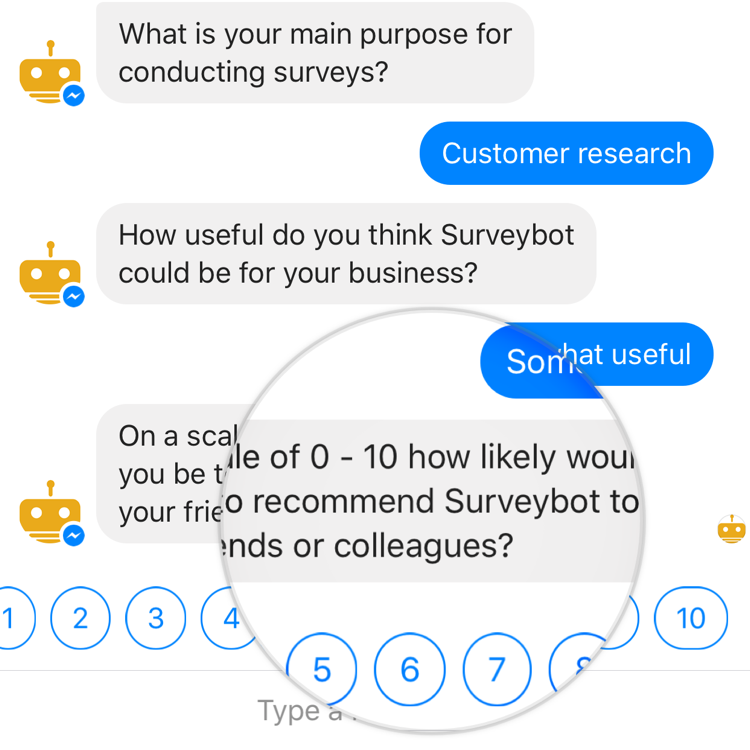 Create surveys using our chat bot survey builder and seamlessly deploy to Facebook Messenger. With 12+ question types, advanced conversational logic, answer piping, re-engagement rules and loads more features. You can create your very own conversational surveys and get better results from your respondents. Build your survey panels of subscribers who answer your surveys using Facebook messenger. 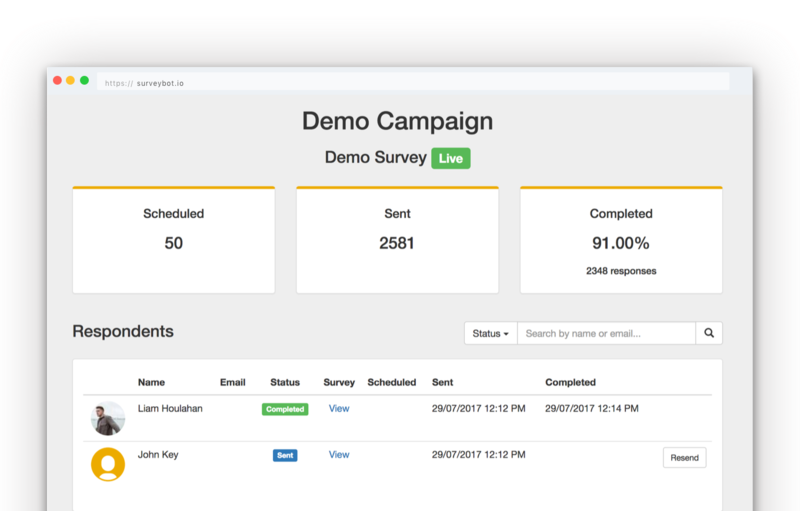 Create panel segments to group your subscribers by their profile attributes, surveys completed/incomplete and question answers. Distribute your surveys to your respondents in Facebook with Campaigns. Create campaigns to send surveys to your subscribers over Messenger, distribute your surveys with Facebook posts that auto start your survey when someone comments on your post. And target respondents with Facebook Ads to maximise your research. 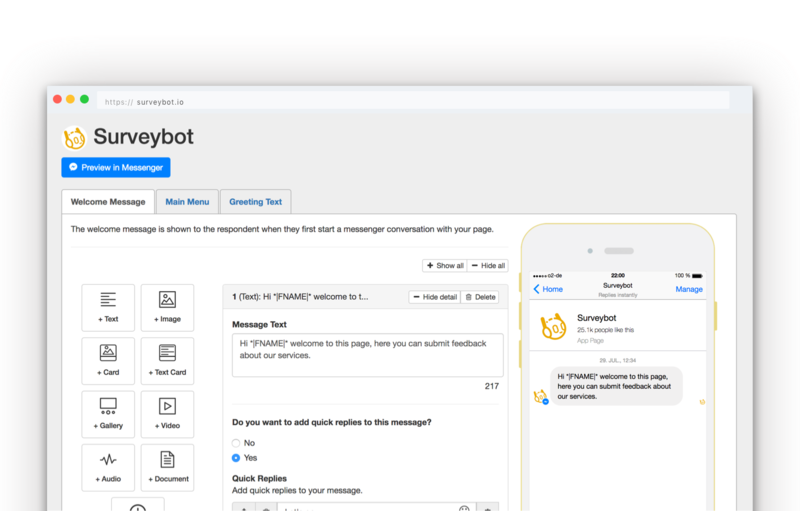 Manage your Facebook Messenger experience outside of your surveys with Bots. Setup custom greeting text for when respondents first open your page in Facebook Messenger. Create advanced Welcome Messages to give your respondents options and setup your Facebook Messenger menu to link to your surveys and website links. Try our example survey on Facebook Messenger to see what it's like.
" 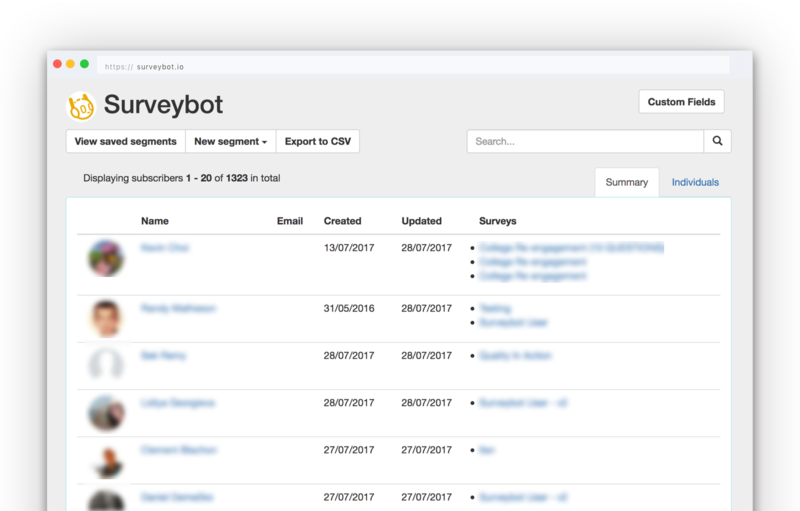 Surveybot offered a great solution for us to poll many employees without having to bore everyone with a tedious survey. I’d never expected that setting-up a bot could be this easy! " " Surveybot has given me the ability to bootstrap the development process that goes along with creating a mobile app. Their dedication to customer service has been the real kicker for me; I feel as though I am a top priority at all times. " " The best part about Surveybot is that there’s no coding experience required. After visiting their website and setting up the survey, you can deploy it to your Facebook page. 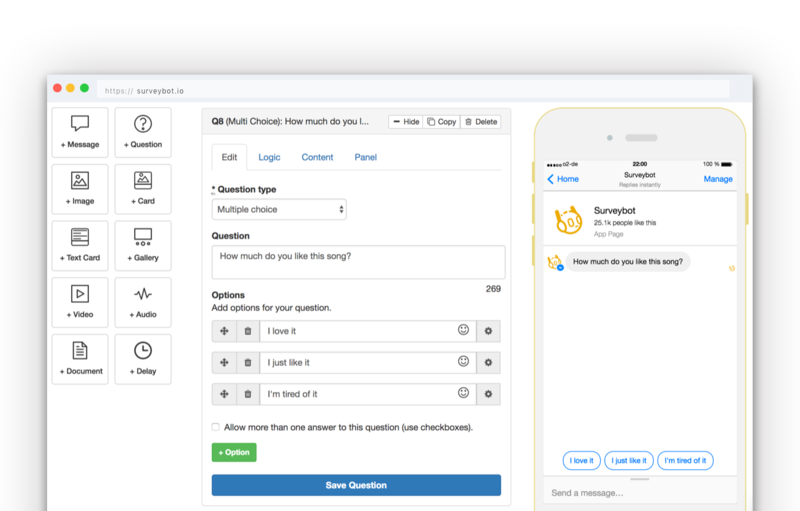 As in the case of many other chatbots, Surveybot reduces the friction users experience when responding to surveys. " Create your very own surveys to engage with your audience over messenger.